Have you seen these lights before? I took this photo at a popular restaurant in the Cape Town vicinity. It's near the ocean and they serve great sushi. 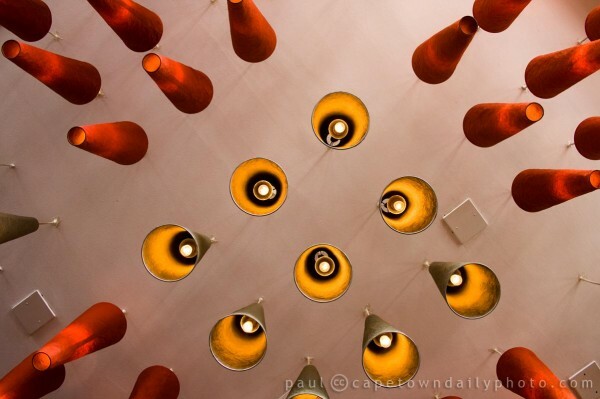 Do you recognise these ceiling lights; have you seen them before? Posted in General and tagged lights, restaurant on Wednesday, 15 September, 2010 by Paul. Paul, think that is Wakame … but I might be wrong ..
I’ve seen ’em. I took a shuttle on a shockwave ride where people on the pen pull the trigger for accolades. I’m with Marius on this one – I also think it’s Wakame.